Hydra Comic Con is excited to announce our next guest: Mel Rubi! Mel Rubi is a Professional Comic Book Writer/Artist. For two decades, Mel has freelanced for great companies such as Marvel, Valiant, Image, Dark Horse and Dynamite Entertainment. He’s best known for his work on Red Sonja, Star Wars, Doctor Strange, Punisher War Journal, Uncanny Xmen, Kiss and Grifter. Rubi started off as an aspiring self-taught artist. Some of his influences came from Frank Frazetta, John Buscema and Bernie Wrightson. 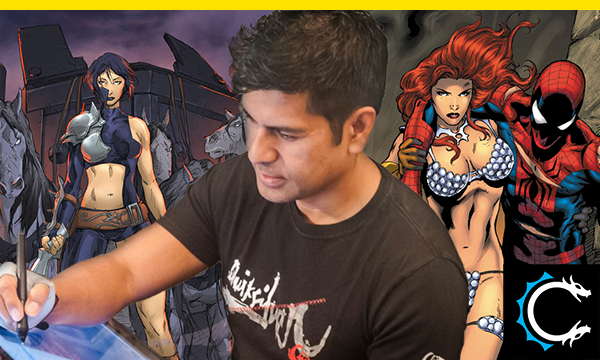 He began his artistic career as a draftsman in an engineering firm but soon realized his true passion towards becoming a comic book illustrator. After three years of submissions, it was during the 1993 Wonder-Con where he finally broke in the field of superheroes and was offered a position right on the spot as a penciler for both Marvel and Valiant. Mel has worked for major game companies such as Electronic Arts, Bioware and Klicknation. He is currently with at 5th Planet Games as a Senior Artist and continues to enjoy freelancing at his spare time. He’s also developed a creator-owned project called “Boundead”. The rest is history.